Sunday 4:00pm through Friday 6:30pm. 2 day-trips (Monday and Tuesday) and a 2-day-1-night overnight trip (Wednesday-Thursday), paddling on the historic, beautiful James River. Your week begins spending Sunday evening at Camp Bethel preparing and getting to know your group. On Monday and Tuesday, we depart each morning for day trips on the James River, learning to paddle like experts, and returning to Camp Bethel for dinner and on-site camp activities. Wednesday and Thursday is our overnight canoe trip: paddling, camping, cooking, playing, and living as Christians as we adventure together. building up to Thursday’s run of Balcony Falls. Friday includes the Camp Bethel high ropes course and zip line, clean up, and a Eucharist celebration before a closing dinner and 6:30pm dismissal. The daily itinerary may change due to weather, river conditions, or the needs of our group. Your excellent trip leaders are certified by the American Canoe Association, and include Joe Harden, Jess Gawor, Geno Iannocone, and Camp Bethel Adventure Counselors. The River Adventure Program has provided canoe adventures and trips for over 37 years. We experientially build an intentional Christian community in the outdoors as we face the intense demands of supporting each other during work-duties and challenging group activities. This experience enhances self-esteem, encourages positive Christian values and develops leadership. Each experienced leader is certified in Moving Water Instruction by the American Canoe Association, plus CPR & Wilderness First Aid. Camp Bethel Adventure Counselors accompany each trip. Equipment essentials are provided, but week-long trip participants must supply their own duffel bag, sleeping bag and personal items from a Confirmation Packet and gear list we send you after registering. Rated moderate with challenging options. Prior experience is not necessary, but the physical nature of canoeing requires good health and average ability, (ex: carrying your gear plus helping with group gear). Participants must pass a swim test on the first day of camp. Subsidized Fee (discounted cost) = $460; Supporters Fee (actual cost) = $510; Sustainers Fee (cost + $50 gift) = $560. 1. Choose your Fee Option Payment OR Deposit Only below through our secure "Register Now" PayPal button using a credit card or a PayPal account. Any balance due and/or Add-On activity will be billed to you separately in a few days. There are no added fees for on-line registration, and you will be able to review your total prior to payment. $50 of your deposit or payment is non-refundable unless Camp Bethel cancels the camp program, (see "Cancellation..." information below). 2. Submit Data: After successfully paying your deposit, PayPal will direct your browser to our secure on line 2019 Summer Camp Registration Form (which is a Google Form). Allow at least 15 minutes to complete, and be as thorough as possible before you SUBMIT the form. If your browser doesn't redirect you to the Registration Form, please access that form HERE. 3. Get your Confirmation Packet: After submitting your Registration Form, ​your browser will direct to Camp Bethel's Confirmation Packets page (for you to print). We'll also send you an e-mail with links to your packet which includes your gear list, a required Health Form (to be completed and returned to Camp Bethel), your Balance Due (if any), and important information about your program. Why 3 Prices for Summer Camp? The Choice is Yours! Each family is different, so Camp Bethel offers a voluntary fee program. You know your family's finances better than we do, so choose the fee most suitable for your family. All campers receive the EXACT SAME QUALITY Camp Bethel experience, no matter what amount you choose to pay or contribute. The Supporter's Fee is what it actually costs Camp Bethel to provide this summer camp experience for one camper, including counselor and lifeguard pay, utilities, insurance, meals, building and grounds maintenance, vehicle upkeep, replacing outdated equipment, accreditation and permits, program supplies and curriculum. Choosing the Sustainer's Fee (actual cost + $50 gift) gives you the opportunity to help us do more with the mission funding we receive. You help us stretch our limited campership funds to help more children experience the power of camp. You help Camp Bethel make needed improvements and foster future growth in all we do. Through mission funding dollars, we are able to offer a Subsidized Fee. This reduced (subsidized) rate is made possible by our District congregations, multiple annual fund-raising events, and gifts from individuals who value the impact the summer camp experience at Camp Bethel has on children, youth, and families. Please notify the camp office 540-992-2940 or CampBethelOffice@gmail.com in advance if your camper will not attend this session. Campers are expected to attend this camp in its entirety. Late arrival and early departure is discouraged, but allowed in case of illness, family emergency or conditions beyond control. 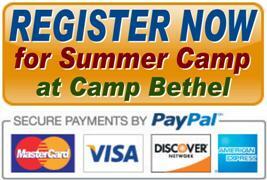 (1) $50 of your deposit or payment is non-refundable unless Camp Bethel cancels the camp program. (2) A $20 processing fee must be added if you choose to switch or reschedule your camp date. (3) If complete payment of the camp fee (or scholarship approval or Good-As-Gold form) is not received 14 days prior to your camp date you will forfeit your reserved spot. (4) There are no refunds for cancellation of reserved spot in camp within 14 days prior to your camp date. (5) There are no refunds for partial camp attendance or early departure for any reason unless Camp Bethel cancels the camp program.